Vodafone Essar and Research In Motion (RIM) today announced that the highly anticipated BlackBerry® Storm™ , the first ever touch-screen BlackBerry® smartphone designed for Vodafone, will be available exclusively for Vodafone customers in India from 15th January, 2009. 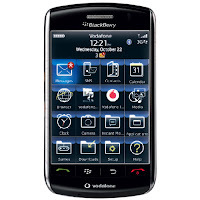 The BlackBerry Storm delivers the renowned functionality of the BlackBerry solution and provides consumers and business customers with entertainment, information and communications at the tip of their fingers. Priced at Rs 27,990, the innovative smartphone will be available across select Vodafone Stores nationally from January 15, 2009. Vodafone will create more than 150 ‘experience zones’ across the country in Vodafone Stores and Modern Trade Outlets to encourage customers to experience the revolutionary smartphone. that dramatically enhances the touch interface and enables easy and precise typing. The world's first “clickable” touch-screen responds much like a physical keyboard and also supports single-touch, multi-touch and gestures for intuitive and efficient application navigation. The innovative SurePress™ touch-screen depresses ever so slightly to aid in typing and navigation and to give users an experience they can actually feel. It also features a built-in accelerometer, which automatically switches the display for use in landscape and portrait as the user rotates the handset. Whether shopping for a gift online, editing important documents or reading a map, the BlackBerry Storm smartphone brings images to life with stunning clarity through its 3.25-inch, high resolution (480x360-pixels at 184 ppi), colour display.